Shelves designed to store individual boxes or single products. Ideal systems for goods which are stored or retrieved manually. Basic system of manual storage and archiving for light and medium loads. Racking for live picking is made up of slightly inclined platforms of wheels and roller, which guarantee an optimal entry and exit of goods. 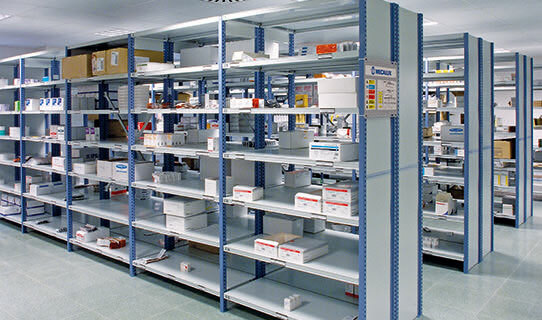 It is a set of shelving units mounted upon mobile bases which move along rails. Storage system for light goods. A simple and economic solution for a wide range of uses.